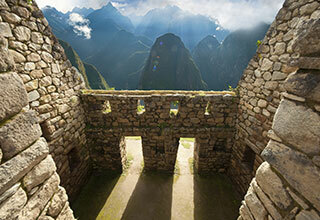 New World Wonder Machu Picchu deservedly tops the agenda of most visitors to Peru. Set on a lofty plateau surrounded by the soaring and dipping Andean peaks, this ancient city is a stirring reminder of an advanced and powerful civilization. For 400 years, it lay silent and forgotten by all but the locals, until Yale university historian Hiram Bingham re-discovered the overgrown site in 1911 and shared what he had found with the world. As word spread about this magnificent lost Inca city high among the Andes, intrepid explorers started trickling in and later, a large tourist influx followed. To combat overcrowding and help preserve the fragile site, visitor restrictions have been implemented. Going early in the morning just as it opens is a novel way to begin a day. At this time, the crowds are usually thinner and the light is particularly fabulous as the sun creeps over the surrounding Andean spires. 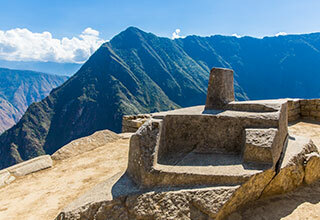 As you explore this UNESCO World Heritage Site, ponder the ingenuity of the Inca people, who built this city in the clouds without using any cement or mortar – just precision measurements to ensure every block fit perfectly together. The innovation and artistry of the Incas is made all the more incredible by the fact that they managed to construct this isolated citadel without the use of the wheel or written language. If you are interested in private tours to Machu Picchu, discuss your options with the Kuoda team, who can advise on the different ways and best times to visit. Don’t let time restrictions or a lack of fitness prevent you from visiting the famous Inca complex; we can arrange luxury tours to Machu Picchu too. Arrive in style via train – we can even secure you first-class seats – from Cusco or the Sacred Valleyto Aguas Calientes, the town nearest Machu Picchu. The total journey time will take around three and a half to four hours. From Aguas Calientes, hop on a shuttle bus, which takes just 20 minutes to reach the site. Please pay attention to the conservation regulations of the sanctuary as detailed on your ticket. Alternatively, you can approach Machu Picchu the old-fashioned way: on foot. The Inca Trail will take you directly to the archaeological site through the main Sun Gate, or Inti Punku, entrance (though there are limited daily permits). 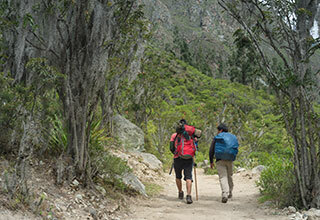 The Salkantay trek (no current limitations) will take you into Aguas Calientes. The Salkantay trek has the added draw of being near a variety of high-class hospitality lodges for those who would rather hike by day and indulge in Machu Picchu luxury travel experiences by night. The Inca Trail, a demanding four-day hike through the high Andes, is undoubtedly the most rewarding way to see the lost city, though permit limits mean you’ll have to book a spot far in advance. This path is the classic route, and ranks up there among the most famous hiking routes in the world. But it’s not for the fainthearted. The trek here is tough and tiring, but the end reward – a glimpse of Machu Picchu framed by the needle peaks of the Andes as you enter through the Sun Gate – is hugely gratifying. Thanks to the road-building prowess of the Incas, there are alternative routes to Machu Picchu. 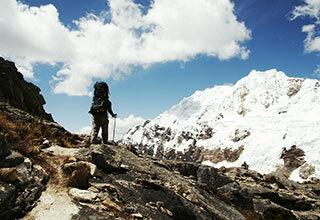 Though it lures in less hikers, the Salkantay Trek is – whisper it – just as unforgettable. Many claim its varied scenery surpasses that of the Inca Trail and because there is less foot traffic, you’re more likely to spot some of the wildlife in the area. National Geographic Adventure Magazine even included it in their pick of the world’s 25 best treks. Here’s the rub: It’s longer, more physically challenging and unlike the Inca trail, you don’t enter through the main Sun Gate.